Alright, this is not a new model, but I never got around to snapping any pictures of him, and since I hadn’t tried out my Foldio lightbox yet, this was a golden opportunity! 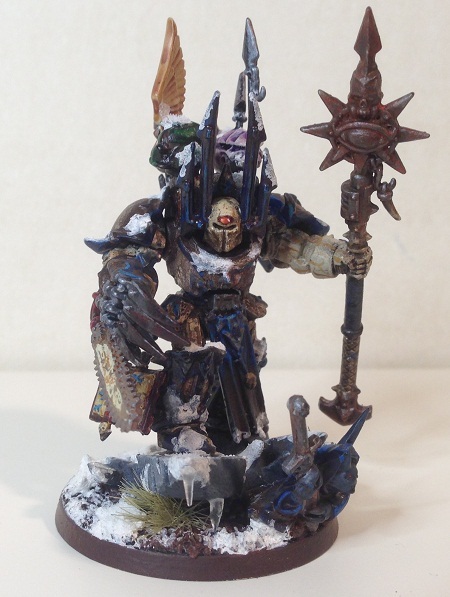 Maximilian McAllistei is my Warhammer 40´000 Chaos space marine lord for my Legion of Discord army. 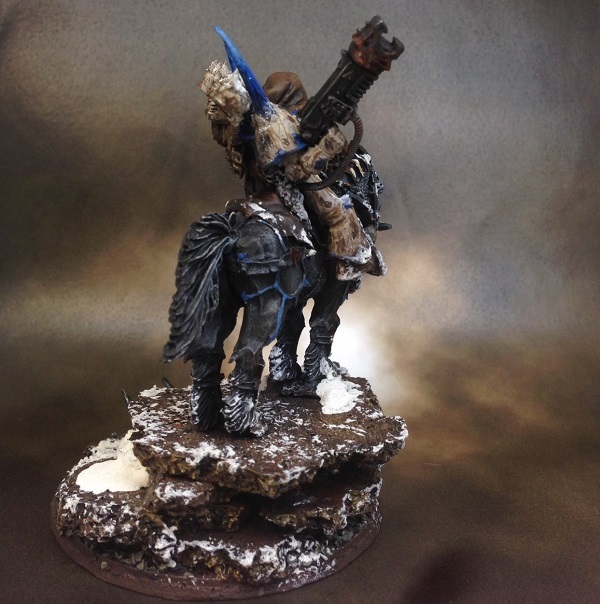 He rides around on his daemonic horse and flames things, ideally. 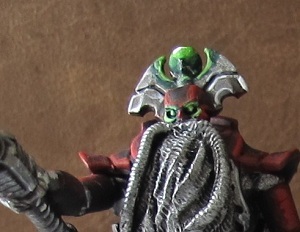 The model is more or less completely scratch built from different kits and I made him as a tribute to the Mutant Chronicles/Warzone Venusian Marshal pictured below, since they’re awesome. The passive, menacing look just tickles me the right way. 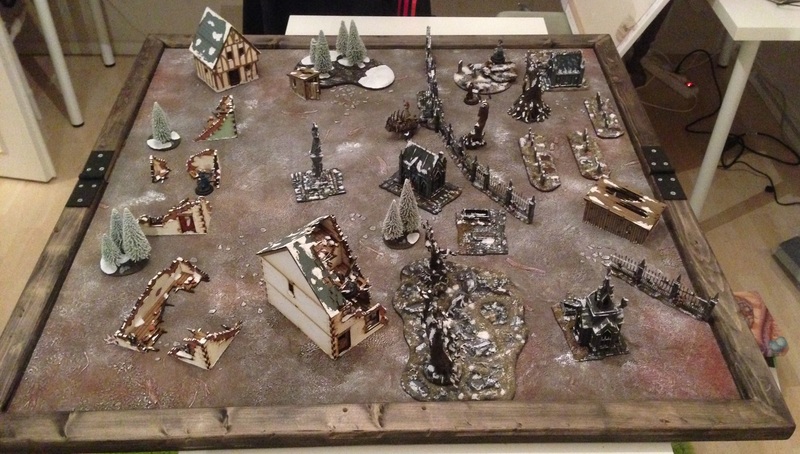 Back when I first started to build the model, Warzone was an old, mostly forgotten, miniature game with old ugly sculpts, so doing something like this really felt like a fun way to honor it – So it was with equal bits of despair and joy I found out there were going to be a Warzone kickstarter to reboot the game. On the plus side, it’s great. I mean, I love the universe. 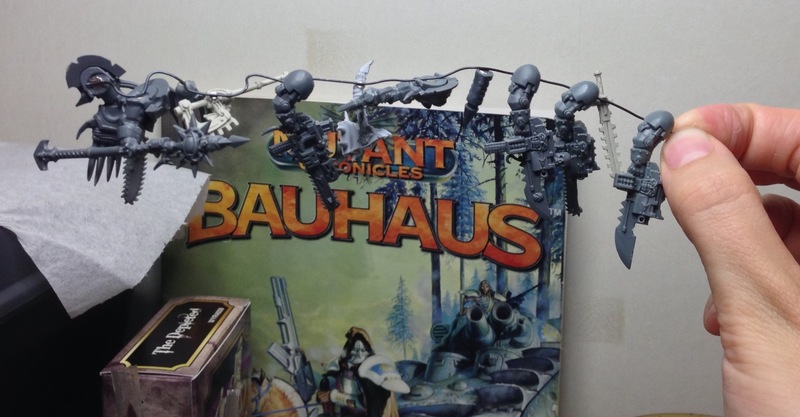 On the downside it sort of punctured my inspiration for my chaos army, since the theme was pretty much a Bauhaus Venusian Rangers color sheme (bone white and blues) mixed with spikes and demons. 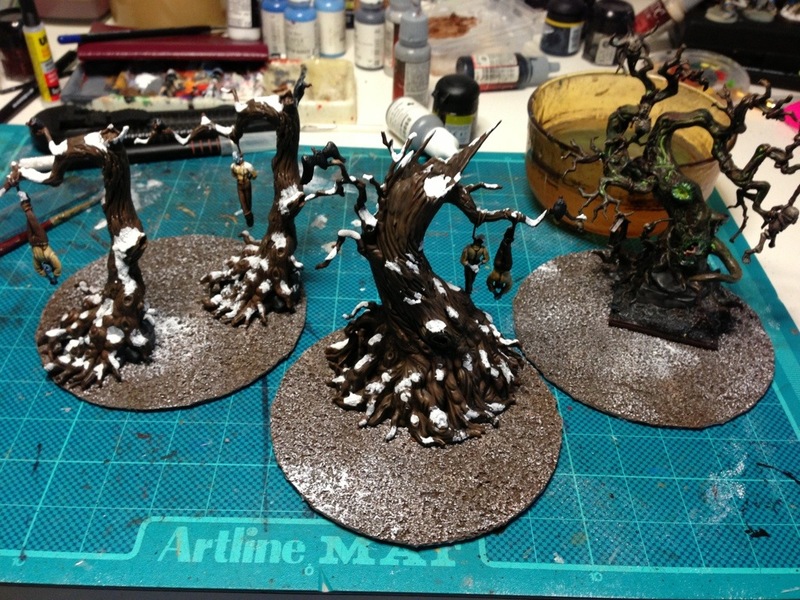 At the moment, I’m not sure where I’ll go with my chaos army, but for now I think it’ll have to take a bit of hiatus. I have other models to paint anyways! 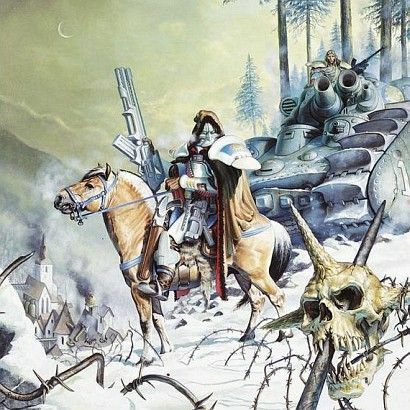 The models main components are a Warhammer Fantasy Daemonic steed, a chaos space marine with a chaos tank commander helmet, Chaos Possessed bits, a mechanical legs and a flamer made out of a bolter, a piano wire and Chaos tank sprue demonic head. The cloak and hood was green stuffed. Not pictured is an axe and a sword and some other weapons that’ve been magnetized so that it can go on the side of the horse. Because I like magnets. So he comes in from nowhere and flames people, and then generally gets shot down. The epitome product of half a years hobby time has finally come to a close, and I’m personally very happy with the results. 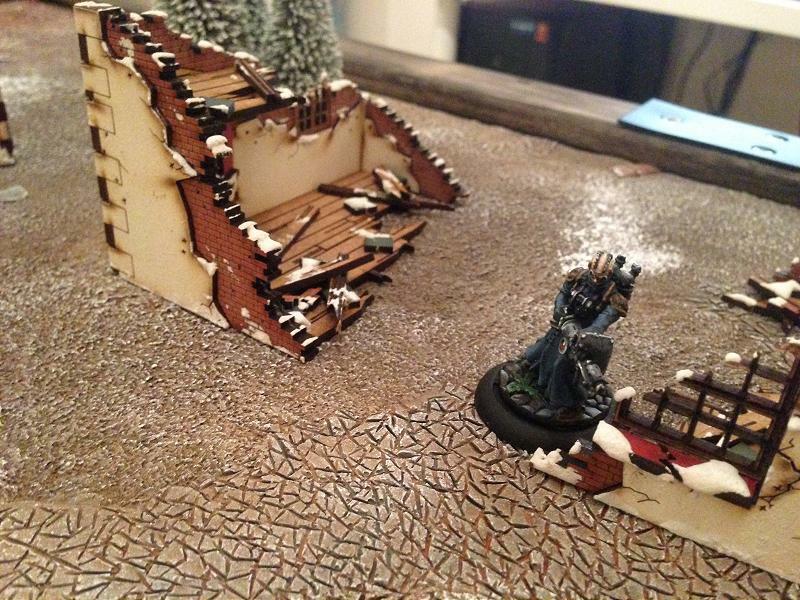 To nag some more about the tournament, I promised the club that I could bring at least two full tables to the convention (a lot of the clubs terrain is needed elsewhere during the weekend). I had a Terraclips table from before, which left me with one table done and one table short. 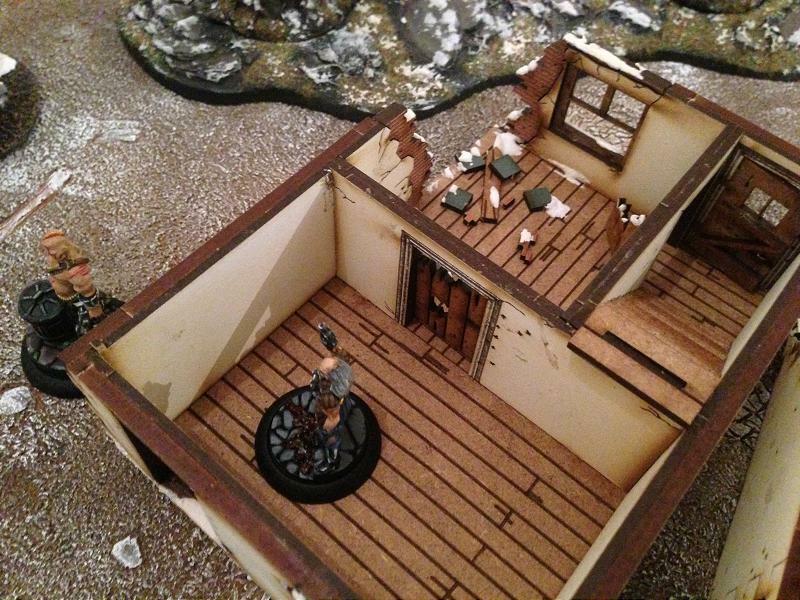 I had already planned to make myself a gaming table for home use, but this sort of forced me to get on with it a bit faster than initially planned (initially there wasn’t really a time frame whatsoever..). 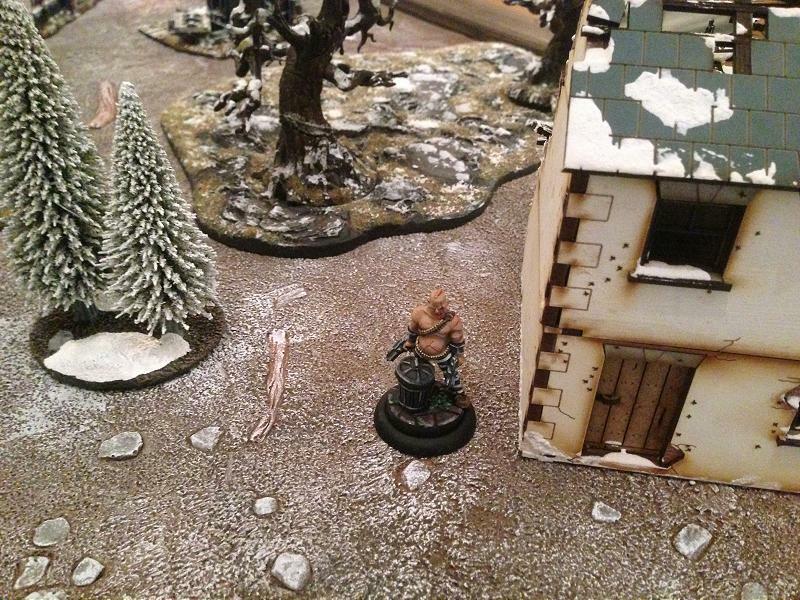 So, as I just recently posted about, I painted up a 3×3′ Zuzzy scourged forest gaming mat. I continued with the winter/tundra theme as I had initially planned. I chose to keep the snow only as partial spots and generic frost, since I figured an entirely white landscape would be a bit boring to look at. 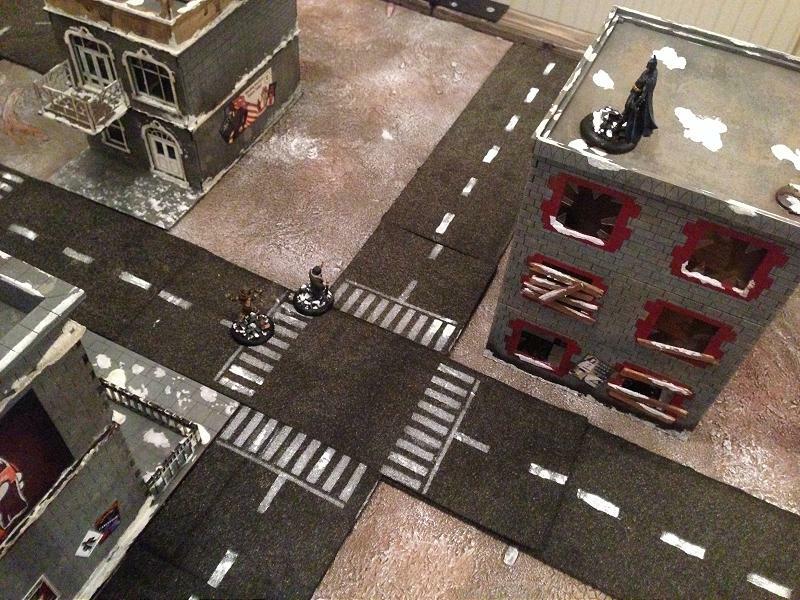 So the general theme of the board was something like “Gotham City in Russia” – Bleak, gray, gothic, worn. 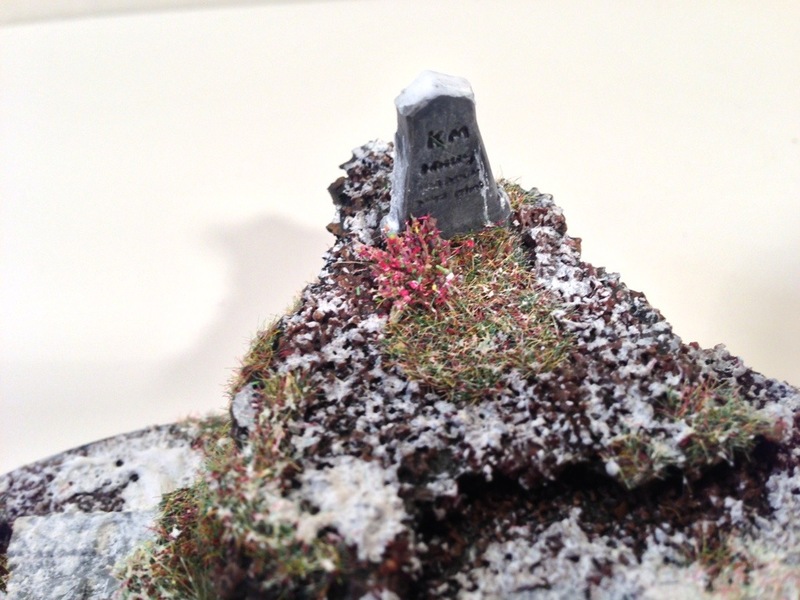 At first I just built graveyard stuff but quickly decided that I wanted something more than a board filled with tombstones. Something like an old worn-out village with an old graveyard in its outskirts. 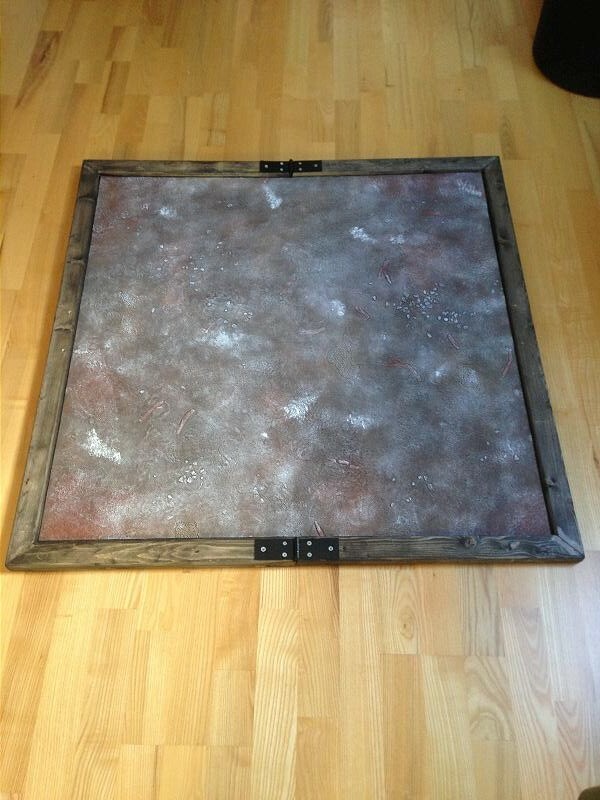 With the aid of my father (yes, I’m close to 30 and still use my fathers help in my hobby projects…) we built a foldable gaming board onto which the gaming mat could be glued. 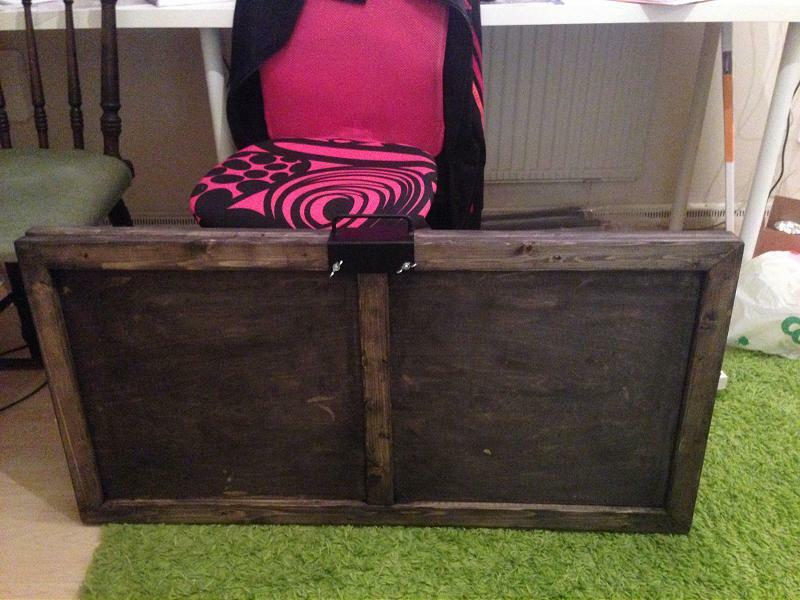 The board was glazed to give it a bit more ancient/gentlemanny look and a handle was added. Below is the board in all its folded glory. The main reason for it being foldable is so that I could stuff it away and play games at home, and help out in transporting it if I ever go somewhere to play. Like a tournament I’m hosting. Cough. 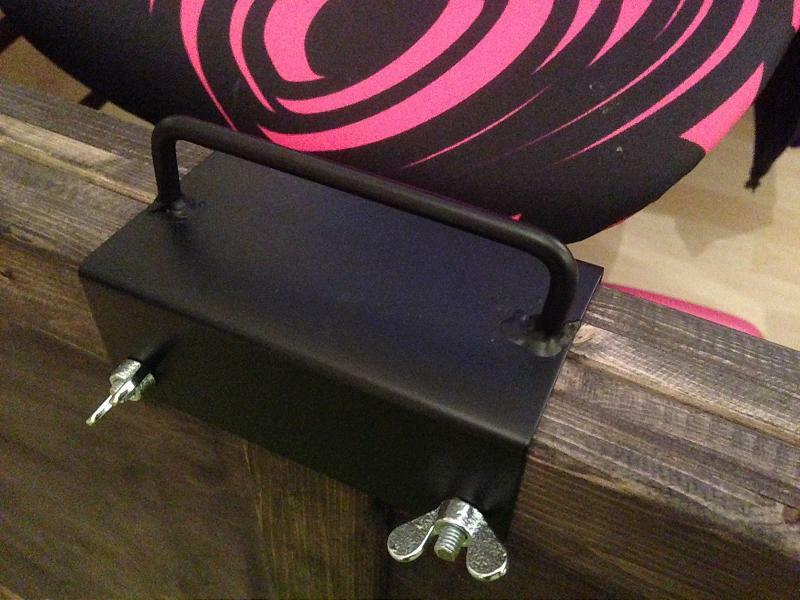 In order to help out transporting it, a handle was made which is secured by wingnuts. This leaves minimal bits of annoyance left on the board when in actual use. 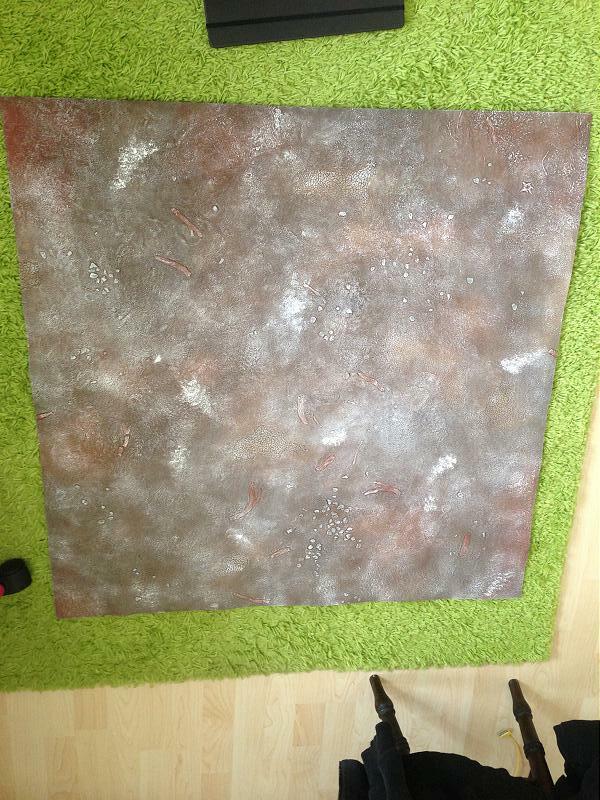 So I glued the mat down with PVA glue. I glued about 50% of the board, leaving the middle 50% unglued, so that once I close the board, it doesn’t rip the mat apart. In other words, the middle section of the mat just rests on the board, but so far I’ve not seen any bubbles or somesuch distractions. The board has a frame so that the Zuzzy mat doesn’t press against itself when the board is folded and stored away. Tuco and Molly has a showdown in the cemetary. Pitiful crying vs. a Shotgun, place your bets! Von Schill scouring the ruins of an old house. Dr. Douglas McMourning discovers a treasure trove of body parts! 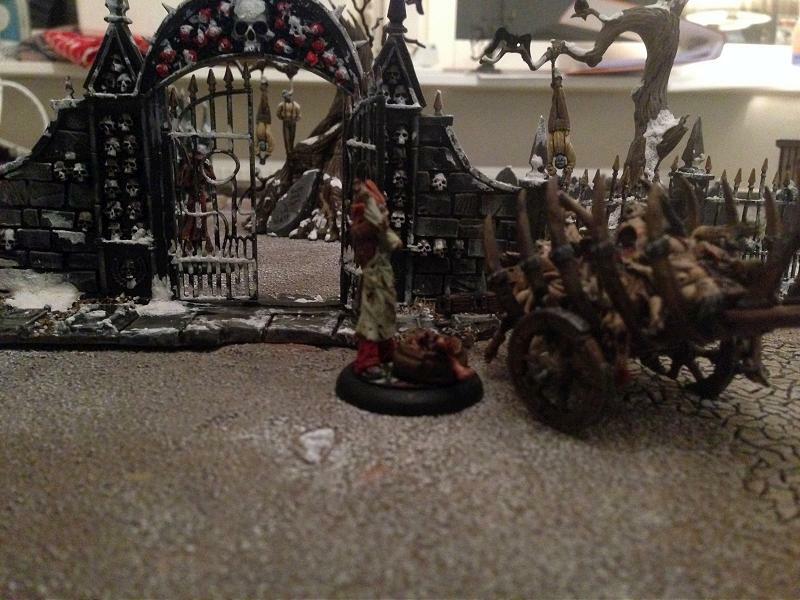 These ruins are great for werfing some flammens at people. 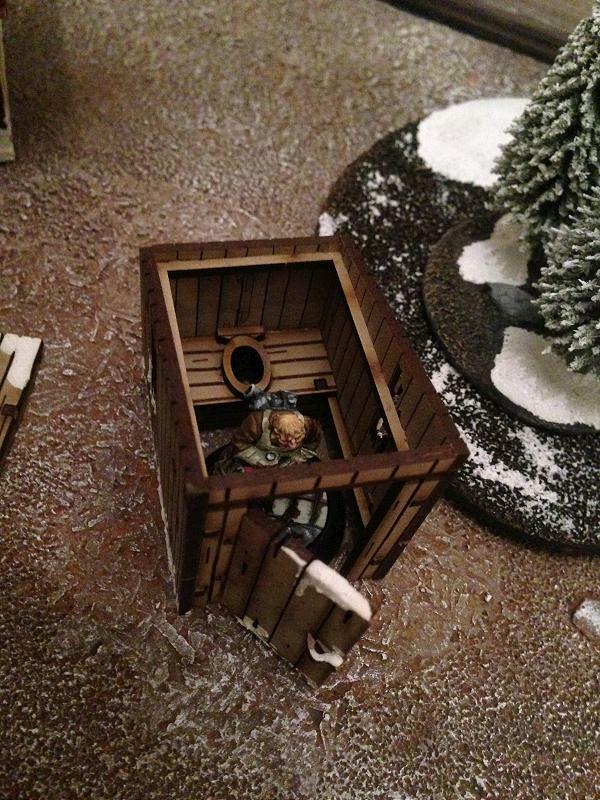 A convict gunslinger sneaking around corners. Von Schill hiding in a room, like the pansy he is! 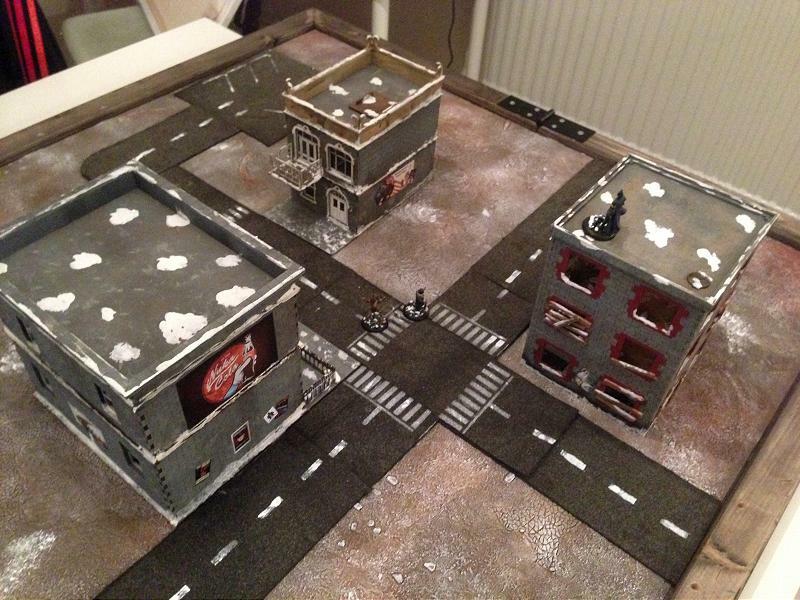 For kicks, I also tried out my “city board” variant. At the moment it’s mainly roads and three houses, but most of the terrain is interchangeable, so I’m not too worried that I need more “modern type” terrain at the moment. The roads are made from a roll of “tar paper” (whatever the actual name of the stuff is). Works well enough and was very quick to produce! In most games, you have area terrain – “A forest” consisting of only one or two trees. 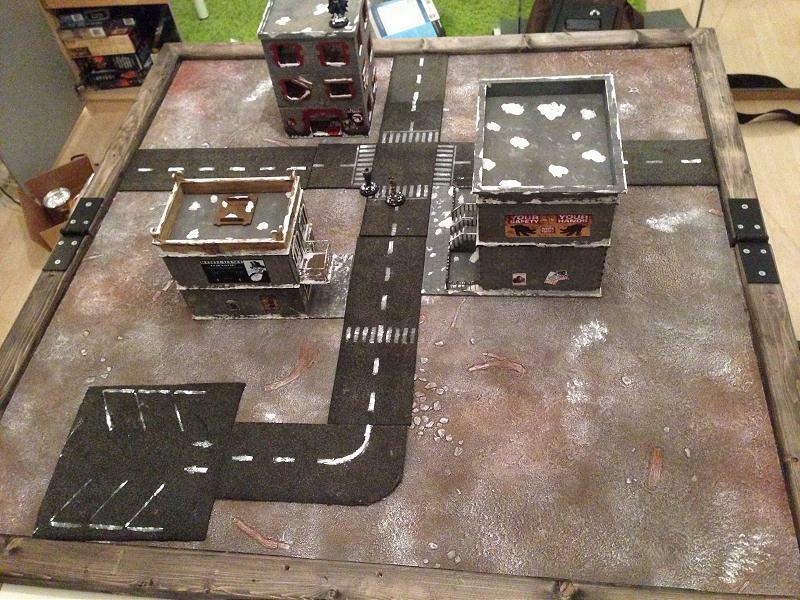 So, with the left-over Zuzzy mat and some old CD’s, I made myself some area terrain. Also, a try-out/sneak preview of how the mat will look with snow. 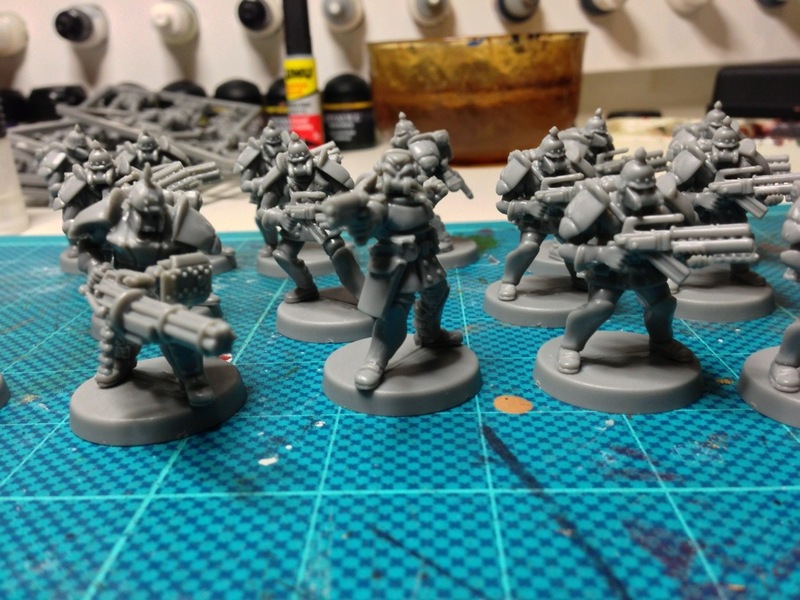 Finished assembling my 23 Bauhaus hussars tonight. Lots of filin’! 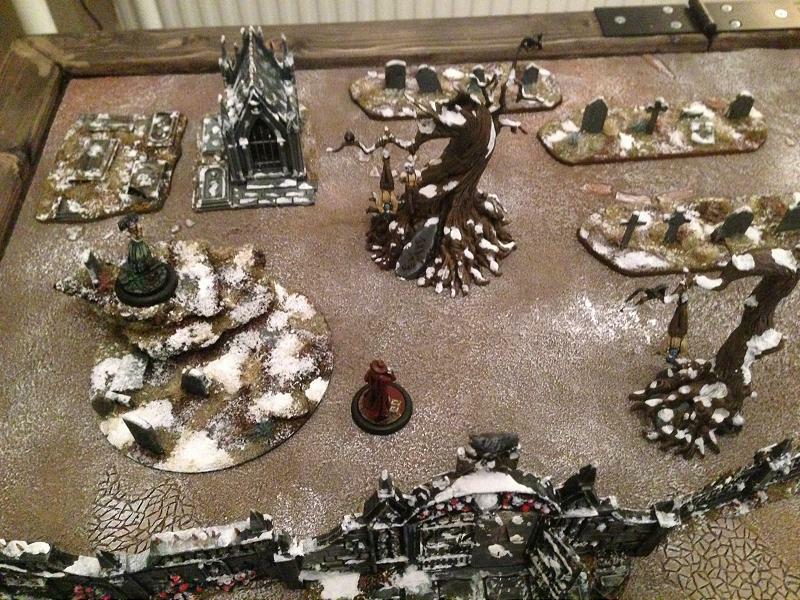 It’s the first peace of my to-be wintery gothicy horrible..-y graveyard board. 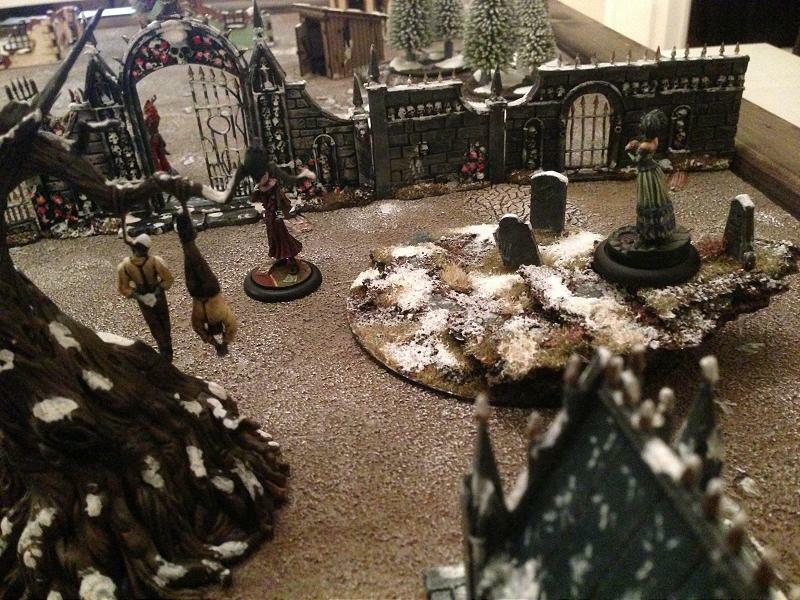 Original idea was to have a “Gotham city cemetary” feel to it – and it always snows in Gotham city cemetaries, for some reason. 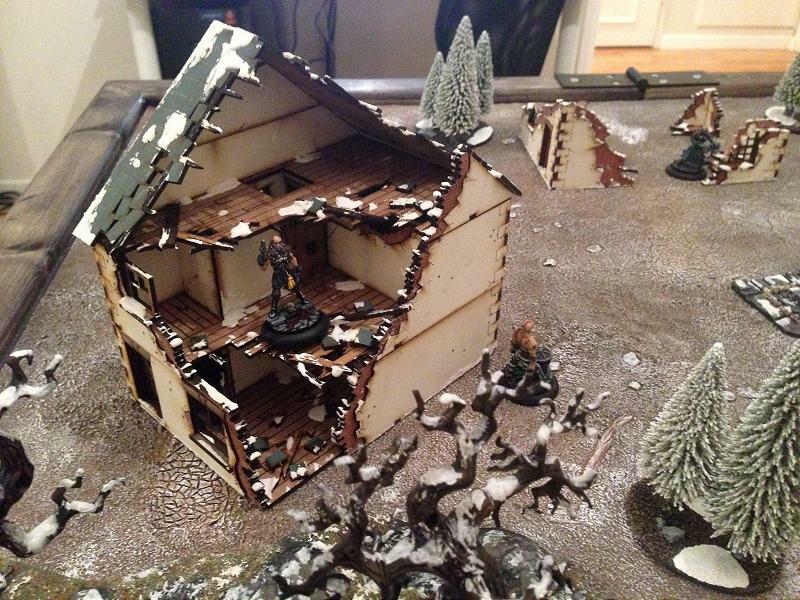 It ended up with a more frosted/tundraish look than christmasy, since I wanted to include some grass and mud and such. It was probably 4 years since I last produced a peace of terrain, so I’m still trying to get the hang of how to do it properly, but I’m satisfied with the outcome. Just a quick one, just received an addition to my painting angst – 80 Warzone models that I’m going to use as cultists for my wh40k Chaos Marines. Ordered these from Prince August just the other day and received it today, so service was excellent. 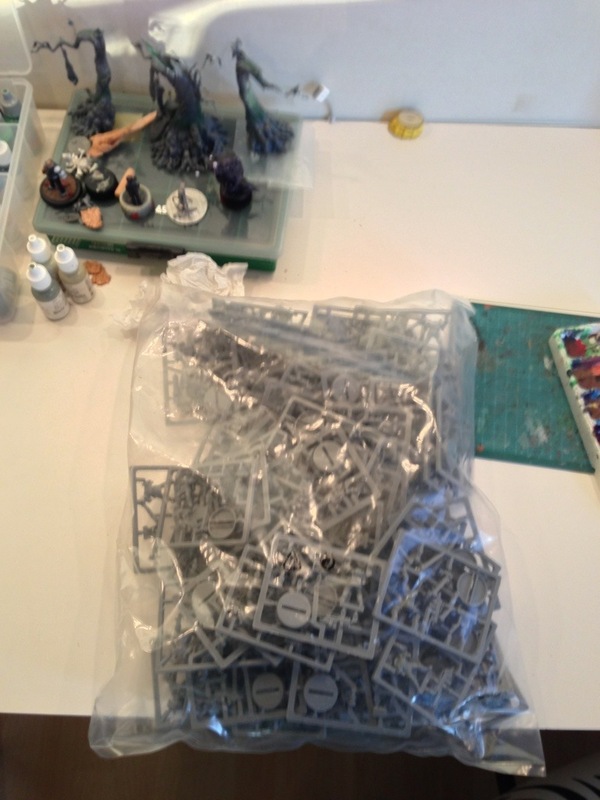 The bag contains 40 Bauhaus troopers and 40 Imperial Troopers. Magnets – what do they stick to? Yes, it’s been ages since I last posted. It doesn’t mean I haven’t done stuff though! It just means that my Wyrd inserts that I need to finish my models are lost in space somewhere and I don’t want to post the stuff without bases. Also, I’ve busied myself with magnets, lots of magnets! I love magnets. And cheese. If there’d ever be a magnet flavored cheese I’d be in heaven. Anyways, here’s a weeks worth of magnetizing! One hoodie away from being Skeletor. Some time ago (I mean, really long time ago. 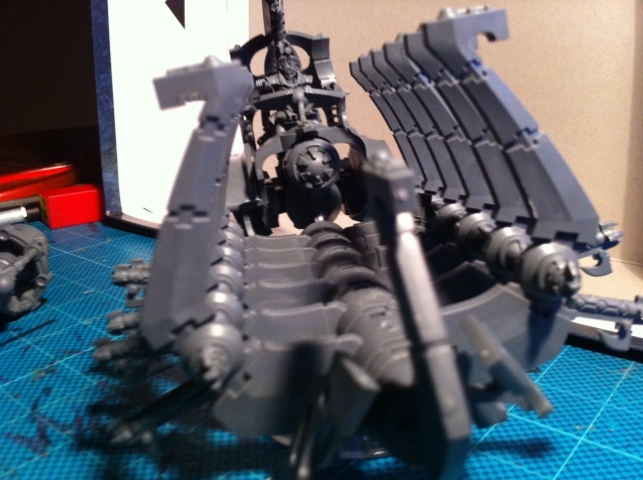 Enough time to make me cringe and get a guilty conscience) I promised to help a mate out assembling his Necron Ghost Ark, as he’s sort of new to the whole miniature business. Ghost Ark looked like it would be a fairly simple assembly, and fairly simple to magnetise. Oh how wrong I was..